Duretti 70 Foot Long Yachts for Rent in Dubai. Perfect for Medium size parties, conference (under 23 people) and fishing trips. Transfer to & from the boat can be arranged at an extra cost, which depends on the length of the rental. This vessel is one of the most favored yachts in the world. Why are these yachts being rented so much? First off, the length of the vessel is the same as the previous one, but it carries a different name. 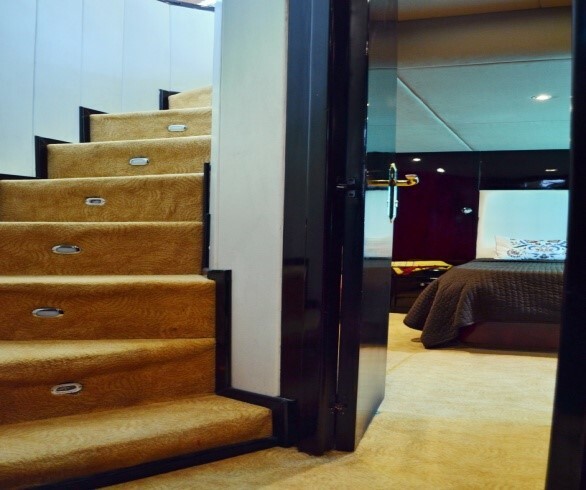 The 70 foot Duretti can not only host up to 23 people but also 3 members of the crew. It is ideal for a one day trip with your friends and relatives, but you can also rest during the night, in 6 well-furnished and comfy cabins. If any of your guests get hungry, you can make food in the fully furnished kitchen. If you enjoy cooking outdoors more you can organize a barbecue and grill your favorite meal. The fly bridge on the 70 foot Duretti is a creation of ingenious and creative design. Other yachts for rent in Dubai are not match for this beast. For 1800 AED per hour you can experience luxury like never before and cruise the Arabian Sea with one of the finest yachts you can rent in Dubai.